Welcome back from that quick break Terriers! If you, like me, have had the pleasure of visiting home for the turkey-stuffed holiday, you may have played a little game I’d like to call the “dirty laundry shuffle.” Whether you pay for it with convenience points or your own hard-earned silver change, doing your laundry is simply a pain. 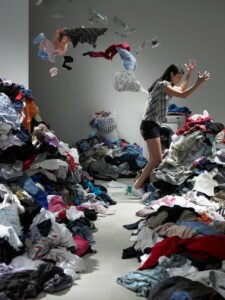 Finding the sufficient number of quarters, carting your obese hamper down a flight of stairs or the Warren Towers elevator and remembering whether your grey T-shirt should go in the “whites” or the “colors” pile is all too overwhelming. Suddenly all your change has disappeared, you have suds all over yourself and you can’t for the life of you remember whether you should wash in hot or cold water. And what the heck does “Perm Press” mean!? I’m stressed just thinking about it. “I know!” you think, “I’ll just bring my dirty laundry home for Thanksgiving with me!” You are so clever, aren’t you – you must be getting some kind of college degree or something. So you stuff your suitcase full of tops that have been firmly pressed into your dorm floor for a few weeks. Now you’ve got a 10 pound friend to bring home, but it will be worth it right? You know that “pro-and-con” list that goes through your head all the time? That’s you weighing opportunity cost – the cost of doing one thing versus the other when both can’t happen at the same time. So when I dirtied half the laundry I worked so hard to bring home, it really made me wonder whether the “cost” of hauling all that home was worth avoiding the “cost” of taking it downstairs to the laundry room. Just some food for thought – I really have no laundro-solutions other than a recommendation to read Freakonomics if you haven’t. 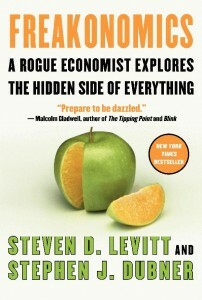 And if you have, read Super Freakonomics – they are both a great read.